Taste test: These are very good ketchup chips, with lots of real ketchup flavor on very crunchy, crisp, curly, irregularly shaped chips. 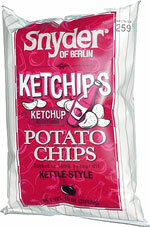 The flavor powder is bright red, with the level of visible flavor powder varying noticeably from chip to chip. The flavor itself varied somewhat, but it was ketchupy and slightly tangy in all cases. These Ketchips earned high praise among our tasters  even some of the regular visitors to the chip bowl who didn't think they would like ketchup chips liked these. Smell test: Really, really nice ketchup smell at first. When you take another whiff, you get some good baked potato aroma mixed in too.